A section of part of the Homestead meteorite which fell in Iowa in 1875. Ordinary chondrites are the commonest type of chondrite found on Earth, accounting for about 90% of chondrite falls and about 80% of all meteorite falls. These figures may be much higher than for the Solar System as a whole because it is suspected that ordinary chondrites have come from a relatively small number of asteroids that happen to be in near-Earth orbits. These near-Earth asteroids are, in turn, pieces of larger parent bodies that were located in advantages places (e.g. near Kirkwood gaps and/or secular resonances) in the main asteroid belt to send impact fragments into Earth-crossing orbits. Ordinary chondrites are composed of olivine, orthopyroxene, variable amounts of iron-nickel alloy, and troilite (iron sulfide). They also contain numerous chondrules, with diameters typically in the range of 0.5 to 1 millimeter in diameter. Ordinary chondrites are distinguished chemically by their depletions in refractory lithophile (silicate- or oxide-forming) elements, such as calcium, aluminum, titanium, and rare earths, relative to silicon, and isotopically by their unusually high 17O/16O ratios relative to 18O/16O compared to Earth rocks. Most, but not all, ordinary chondrites have experienced significant degrees of metamorphism, having reached temperatures well above 500°C on their parent asteroids. They are divided into three groups on the basis of the proportion of free nickel-iron metal and total metal they contain. chondrites have a High content of free nickel-iron (15 to 19% by weight), relatively low iron oxide in the silicates, and smaller chondrules than those of the L or LL groups. Aside from olivine, they are rich in the orthopyroxene bronzite, earning them the older and now-obsolete name bronzite chondrites. The reflectance spectra of H chondrites is similar to that of the main belt asteroid 6 Hebe, which has thus been earmarked as a possible parent body. 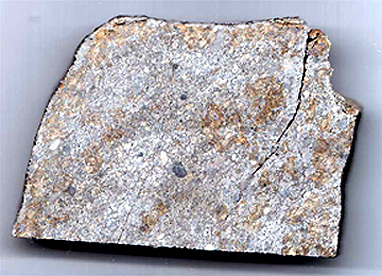 chondrites are Low in free nickel-iron (4 to 10%). Their primary minerals are olivine and the orthopyroxene hypersthene. Reflectance spectra comparisons point to 433 Eros as a possible parent body. In any event, L chondrites bear evidence of severe shock metamorphism suggesting a violent impact history. chondrites (Low iron/Low metal) have only 1 to 3% free metal. Their olivine is more iron-rich than in the other ordinary chondrites, implying that the LL types must have formed under more oxidizing conditions than their H or L cousins. The main belt asteroid 3628 Boznemcová has a similar reflectance spectrum to those of LL chondrites but, with a diameter of only 7 kilometers, appears too small to be a realistic candidate parent body. LL chondrites account for only 10% of all known chondrite falls.